Laura Letinsky photographs material debris left behind on tabletops. Orange peels, breadcrumbs, partially consumed cakes, wine stains, or sometimes a more theatrical octopus spread out in evocative, transitory constellations. At any moment one imagines a figure will enter the picture frame, destroying the aesthetic confluence in an effort to wipe the table down and deposit all captured remnants in a trashcan. This is partly what’s so compelling about these photographs: framed by the camera these typically overlooked bits and pieces reveal a vibrant material presence. Mesmerized by the drama of such enigmatic remains, the table—a framing device as fundamental as the camera—is all but forgotten. For good reason, too. The table is banal and ubiquitous. It comes in many shapes, sizes, and ages, functioning primarily as a stage for human engagement: the dining room table, the desk, the conference table. Always the table is a surface upon which other things happen; the drama it platforms outshines its own constant yet peripheral character. Still we must ask: How does it behave? Can it be interrogated? Is it, for example, a “performing object”—a phrase Frank Proschan uses to define puppets and masks: “material images of humans, animals, or spirits that are created, displayed or manipulated in narrative or dramatic performance”? Although Letinsky’s table consistently supports a material narrative upon which we might project our human selves, the stage of that interaction resists anthropomorphic sentiment. The table is an architectural convenience. It retains an alien thing-ness, even while fulfilling a consistent function within human activity. 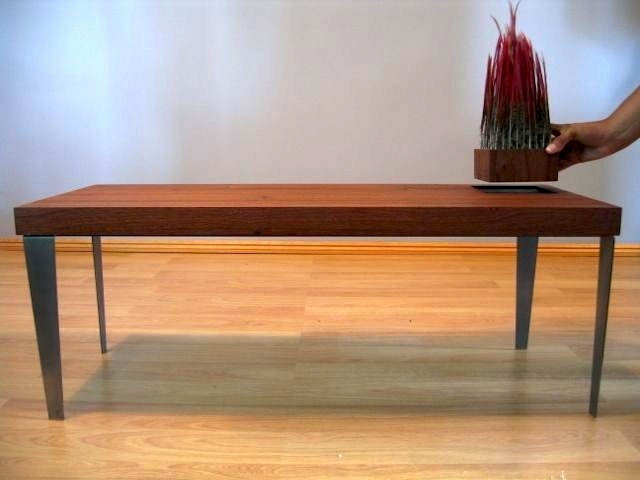 Furniture is often a silent partner in the experience of social interaction. We think of chairs, tables, lights, etc., as functional and serviceable objects that help us navigate and embody physical and social space. What if a furniture form itself were to play a more active role in our social interactions? What if its role in the social order were more present and participatory? Wilson is attentive to the signification of craft: the way certain styles in woodworking affiliate the final object to historical, socio-economic narratives. In Pheasant Brulée (2003) pheasant feathers stick out of a tabletop like elaborate quills; the presence of this additional texture—so fibrous in comparison to the otherwise smooth exterior—draws viewers into new interactions. One wants to touch the feathers. In Brulée Tables (2005), the rather modern tabletop has a separable feather box component that can be placed in one’s lap like a pet. Through these playful modifications, Wilson emphasizes the structures we take for granted, highlighting the hierarchical patterns furniture can reinforce in human behavior. Ira S. Murfin has made a study of “talk” performances, many of which begin at the table. Using performance artists like Spalding Gray as precedents, Murfin highlights the table as an anti-spectacular, and anti-dramatic stage. In a recent collaborative performance that debuted at The Rhino Festival, Our Theatrical Future: A Talk Duet Between Hong Kong and Chicago (Re-Performed), everything takes place at a table for two. The hour-long performance involves two speakers: Murfin as himself and a Guest Artist reading the part of Aaron Kahn. The Guest Artist does not read his or her part in advance, but is given the script via a stack of note cards at the beginning of the performance. The Guest Artist then reads the cards out loud, thereby reenacting Kahn’s part of a previous Skype conversation with Murfin that has since been edited and transcribed. Murfin and Kahn attended high school together in Chicago where they organized, created, acted, and produced their first theatrical endeavors. Twenty years have since passed; the friendship has waxed, waned, and thickened. Murfin has remained in Chicago; Kahn moved to Hong Kong where he is a yoga instructor. During the performance, the friends retrace the steps of their pasts; old plays materialize in the conversation like half-consumed materials. Kahn suspects the first ideas he ever had were the best ideas he ever will have. Murfin confesses he must stop letting his imagined potential self get in the way of the self he really is. A triangle emerges between Murfin, the virtual disembodied voice of Kahn, and Kahn’s flesh and blood mouthpiece, the Guest Artist, who imbues the script with his or her own idiosyncratic tendencies. The table makes this happen, setting a stage then swiftly disappearing. Somehow the ensuing dialogue exists in parallel to Letinsky’s material remains, tracing the outline of a friendship over time. In one iteration of Murfin’s performance that I helped organize, the Guest Artist was Kelly Kaczynski, who makes platforms in her own artistic practice. 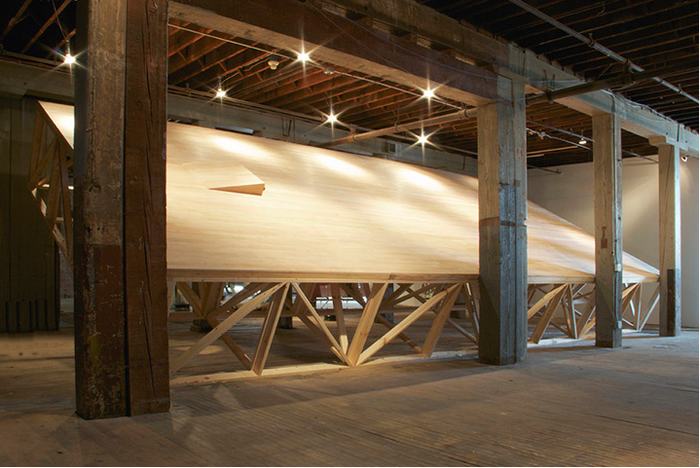 Her massive bare wooden stages consume entire rooms, sometimes—as with Tilted (Twinned) (2013)—set up at angles, so as to remain physically imposing while nevertheless unusable; audience members can neither see the entire stage, nor can they climb on it. Kaczynski describes these stages as fields of infinite potential: any narrative can take place on a stage. Tables possess a parallel potential: anything can be conceived on a table, but disrupt it as platform and it becomes an object with tentacles. 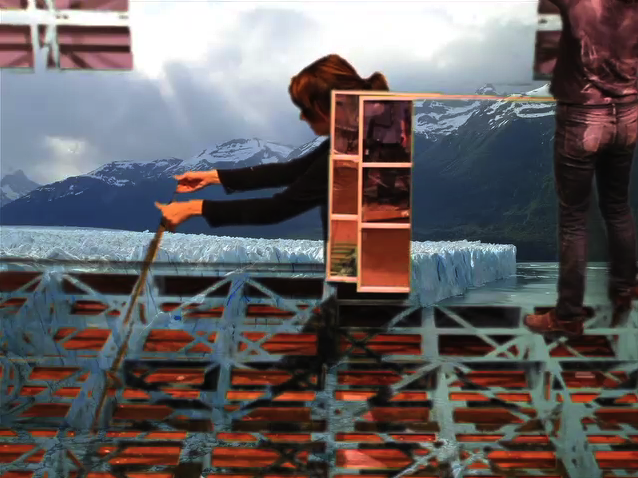 Kaczynski began to work with the green screen as well—a site she recognizes as another kind of stage—a virtual platform that can become anything. Unlike a stage, however, the green screen is only two dimensions, and fully disappears into its subject. Does this make it an ideal stage? Or does it suddenly become trickier precisely because the artifice of the stage-as-device is all the more invisible? 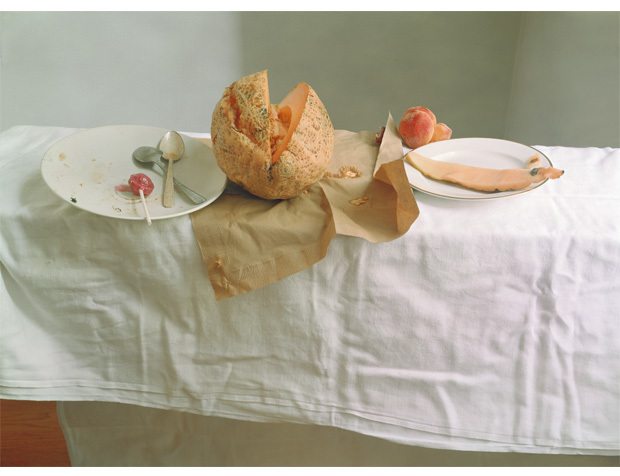 More recently, (as with the series Ill Form and Void Full) Letinsky’s photographs move away from capturing exclusively “real” material, and instead feature a blend of two-dimensional collaged cut out images from lifestyle magazines—pictures of peach slices or silver spoons for instance. The table has flattened as well, and is often represented simply by creased sheets of paper. In these images the embodied material mashes up with the represented material, sharing an unsettled space. 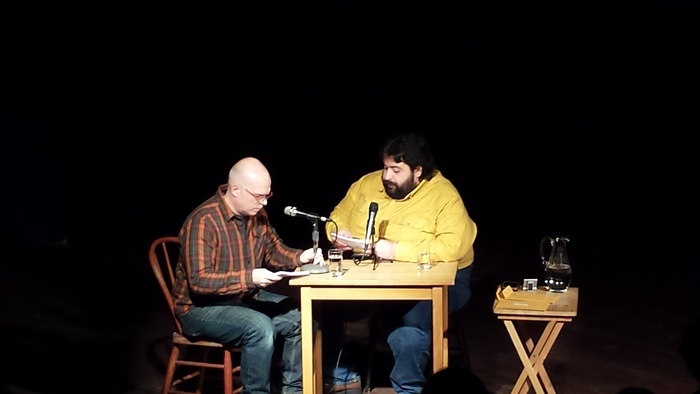 There is something parallel in Murfin’s performance, where members of the audience experience a “real” conversation between friends (in virtual space) as reenacted by a guest in “real” space. The position between authenticity and performance becomes especially slippery. The original “friend”—Aaron Kahn—becomes a two-dimensional character, through which the Guest Artist emerges. In 2012, Graham Harman published an essay, The Third Table as part of dOCUMENTA(13). In it, Harman describes an historic theoretical problem. The real table we experience in everyday life—the one we bump into, or eat off of, or broadcast the news from—is different from the physicist's table made up of particles and electrons. "The scientist reduces the table downward to tiny particles invisible to the eye; the humanist reduces it upward to a series of effects on people and other things." Harman proposes a third table, and with it a third culture: "perhaps it is the culture of the arts, which do not seem to reduce tables either to quarks and electrons or to table-effects on humans." This third culture explores the ambiguity of these tables, engaging multiple facets of the tables' irreducable nature in one frame. Like Letinsky, Wilson, and Kaczynski, the tables are slippery with emergent properties, reinforcing Harman's notion that "the table is something deeper than any relations in which it might become involved, whether with humans or inanimate objects." In Ill Form and Void Full Letinsky suggests the corner of a table with a sheet of paper. The viewer accepts the simultaneity of this experience—we see the paper for what it is, while understanding the architectural role it fulfills, embracing the respective associations, material properties, and functional obligations of paper and table at once. Wilson presents an image of a black table with dishes set upon it. Beside this image, she rests on all fours in the same scale, wearing black, with the same dishes set on her back. Kaczynski's platforms emerge and submerge in turns, exposing a dynamic character not typically associated with stable architectural forms. These representations revel in their complexity, sharing a commitment to tables that "exist at a deeper level than all possible transformations, modifications, perturbations, or creations." Frank Proschan, “The Semiotic Study of Puppets, Masks, and Performing Objects,” Semiotics 47, 1983, 1-4:3-46.